Artist Henry Worrall created this narrative illustration to document a buffalo hunt in western Kansas. 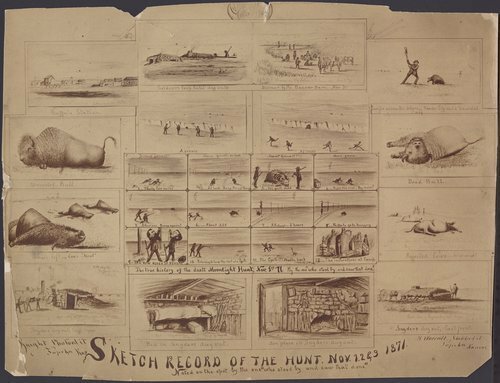 The fourteen sketches that border the document illustrate the entire period of the hunt that took place November 1-3, 1871. The twelve numbered plates in the center illustrate a moonlight hunt that occurred on November 1st. Several illustrations reference Buffalo Station, Beaver Dam on the Saline River, and Snyder's dugout. Sketch record of the hunt. Nov. 1,2 & 3 1871.